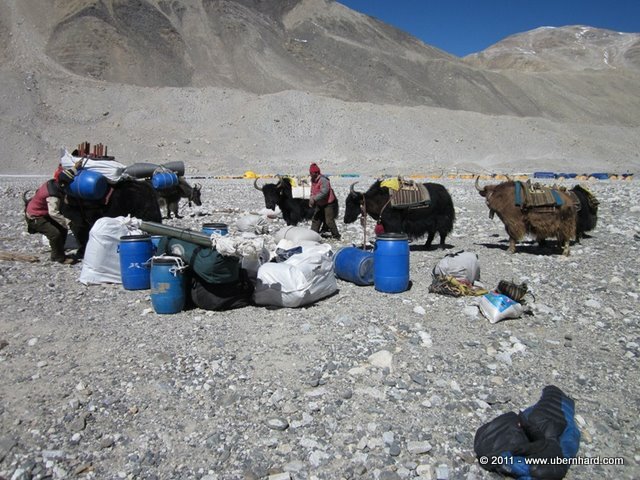 We left Base Camp on April 19, at around 8:30am after our main gear had been loaded on the Yaks. 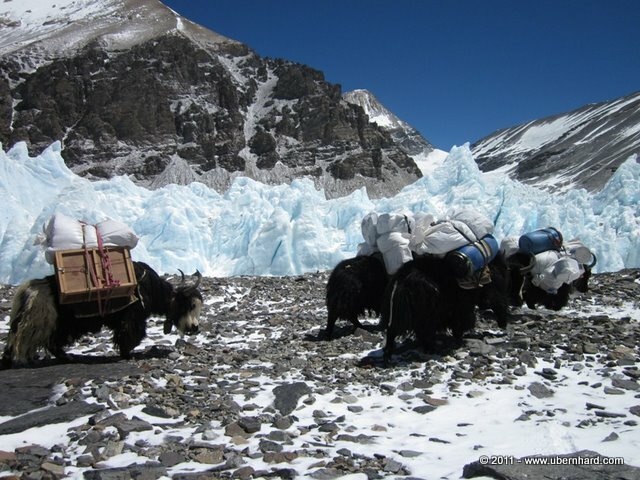 The Yaks are, in my opinion, beautiful and strong animals who are able to carry great loads, even when the official number is 40kg. 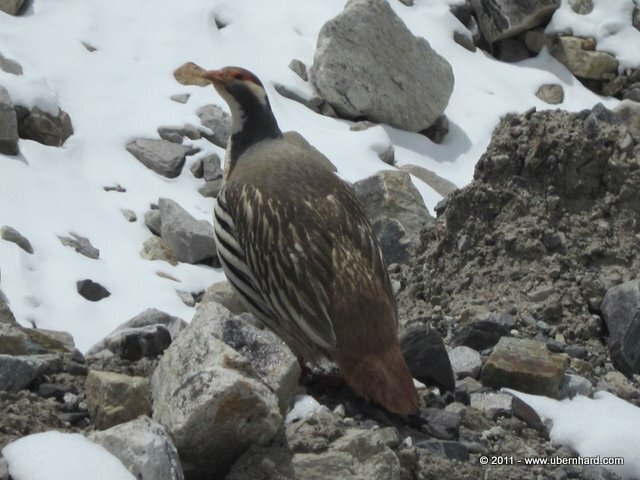 I learned also that they are not able to live in lower altitude but are really good in higher altitude, in our case up to 6,400m/21,000ft fully loaded and sleep outside in the freezing cold. 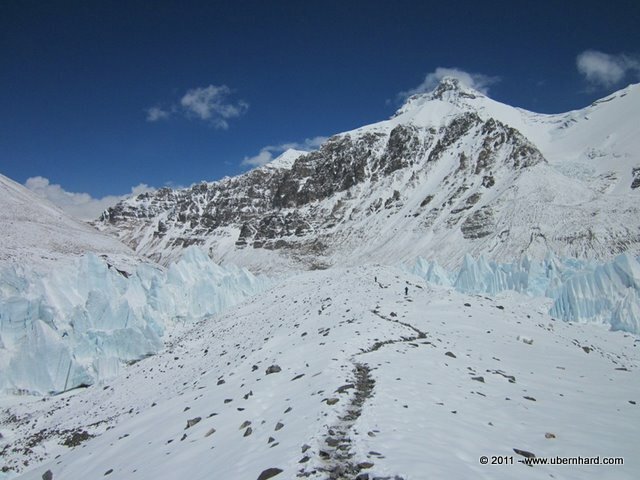 We walked for about an hour along the left sided moraines of the Central Rongbuk Glacier, turned finally left up a steep part into the end moraines of the East Rongbuk Glacier. 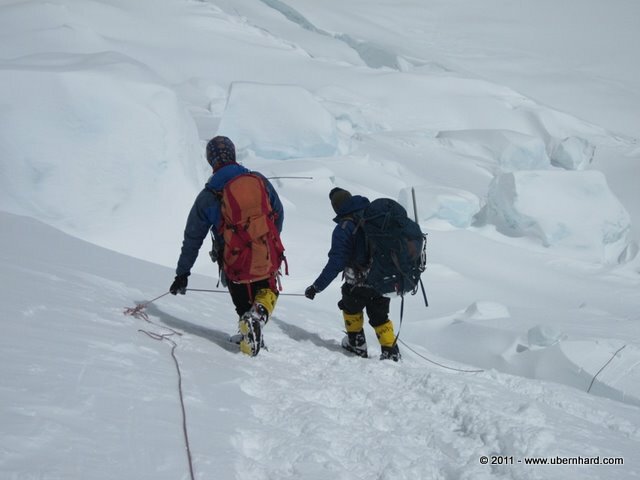 It was a long, at times steep hike up these moraines and we crossed many crevasses along the way. Also, the weather decreased and we ended up walking in kind of snow storm. 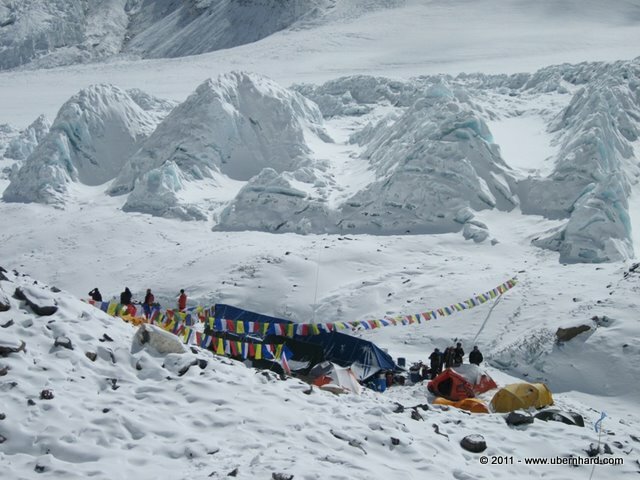 We were all happy when we finally, after about five and half hour hike up the glacier reached our intermediate camp. It was cold and windy and Jim and I went to our tent right after dinner. The next morning was cold, but a beautiful day. 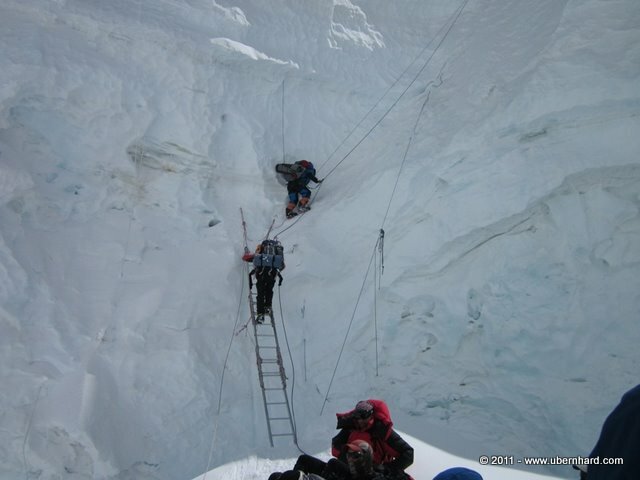 We left at 7:00am and we all knew that it would be a long and tiring day up the Advanced Base Camp (ABC). 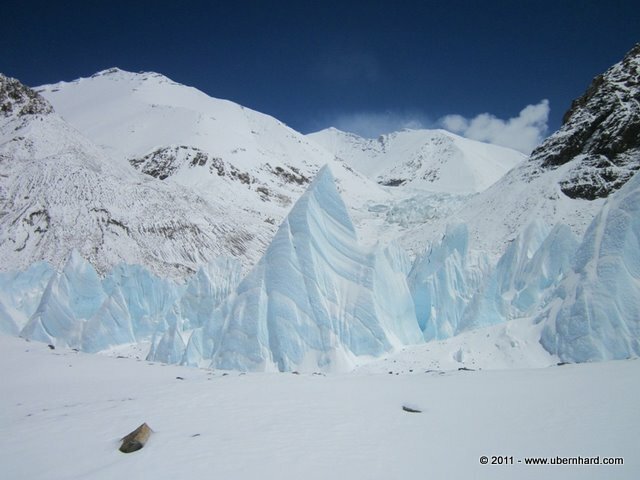 It was definitely a hard hike, up and down on the middle moraine of the Ease Rongbuk Glacier, gaining slowly more and more altitude. Then, suddenly, we came to see on both sides of us beautiful scenery: Huge pinnacles, reflecting in the sun light like majestic towers. 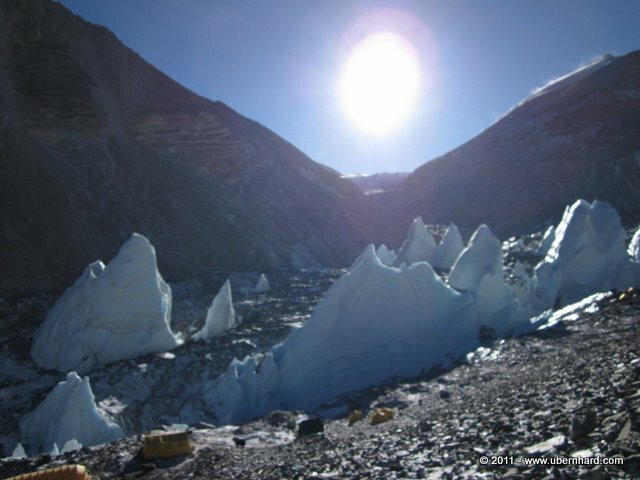 The ice had melted into innumerable pinnacles, some were up to 15m/50ft. Jim informed me that it is called the “Miracle Mile” and it really looked like a miracle. What an amazing spectacle of nature! For us, it was still a long way to ABC and we kept on moving. 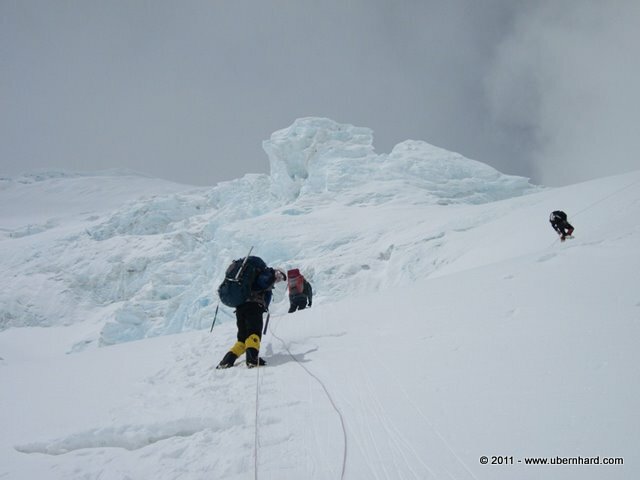 After about seven hours we finally arrived at ABC, at 6,400m/21,000ft. It was very windy and all of us were very tired after this long, but beautiful hike. 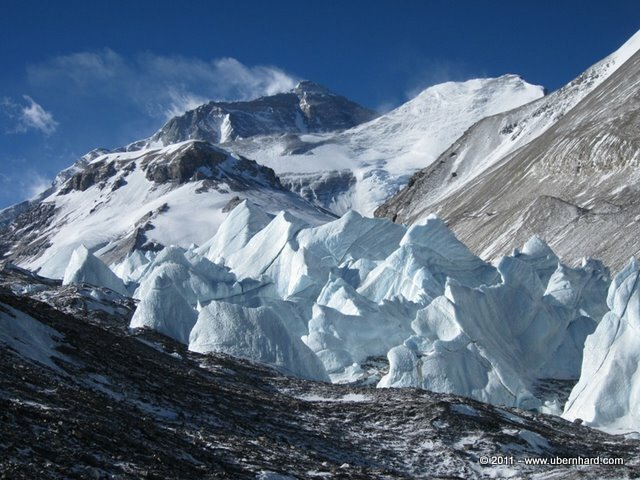 ABC is situated on the north side moraine of the East Rongbuk Glacier and we have a beautiful view from here across the glacier as well up the north side of Mount Everest. April 21 was a rest day. We definitely needed it. It was still very windy and cold. 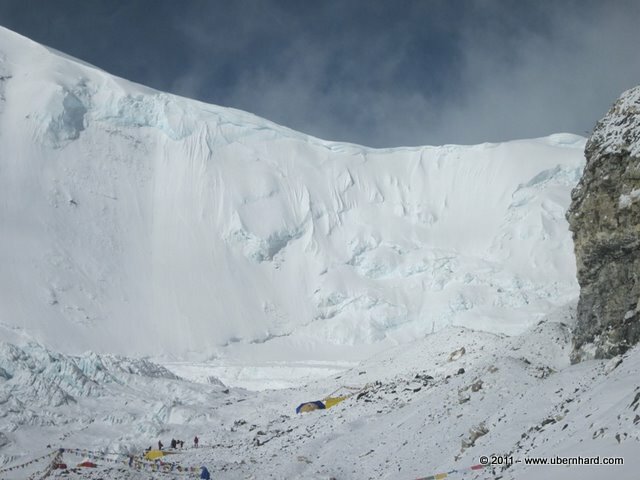 Some of us, including the Sherpas, had light headaches, which is normal at this altitude. We should not forget that we are currently higher then Mount McKinley/Denali. 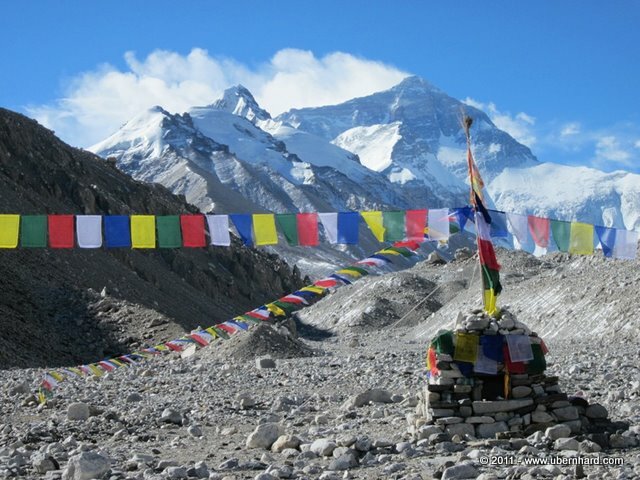 I felt good today and took a short walk up to the top of the camp where I had a great view of Everest and the North Col, our next climbing goal. 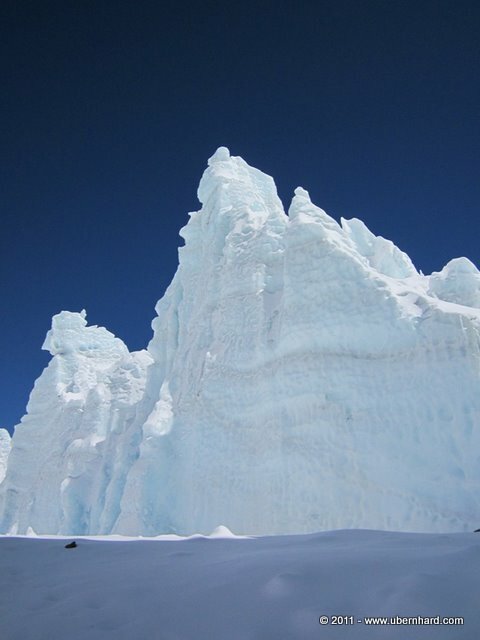 Some climbers already climbed up and down this beautiful snow and ice covered wall. I also found a China Mobile station up there (at over 6,400m/21,000ft!!! Unfortunately it did not work. The rest of the day I spent in the tent, reading and going through my equipment. The next day, April 22, after an extremely windy night, we had breakfast around 8:30am. It was still windy, but it seemed to be less strong. Jim and I had another few hours rest before we started our “climbing practice” on one of the pinnacles on the glacier below us. It was cold again but the practice was very helpful and it gave us an idea what there is still to come. 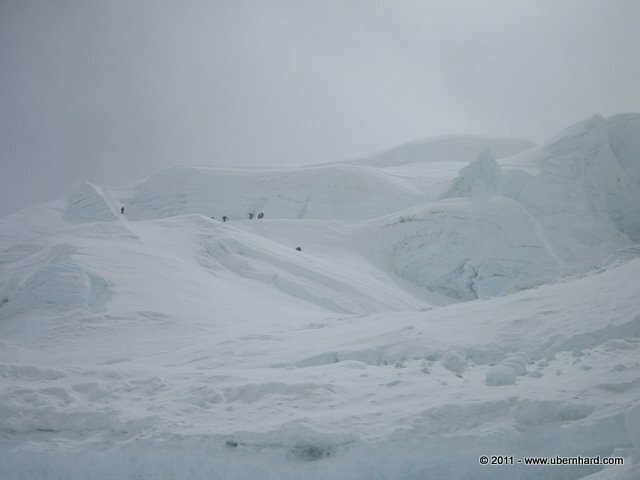 On April 23 we left our camp at around 8:30am. It was a beautiful day with now wind around, at least in the morning. Our goal was the North Col, or at least as high up as possible. 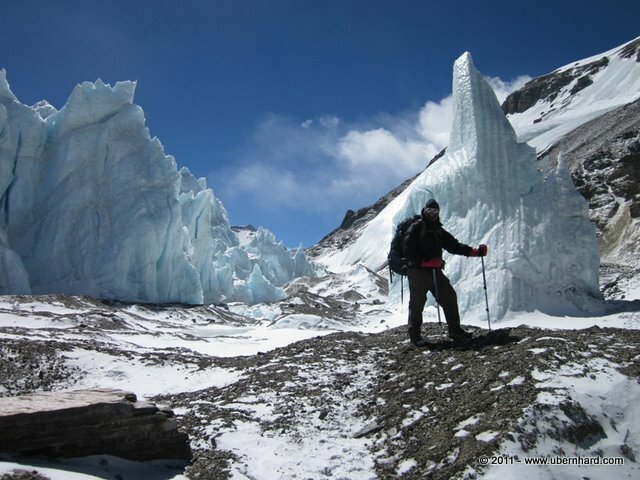 At first, it was a long and unpleasant walk on rocks on the top of the side moraine from our camp until the beginning of the North Col ascent. It looked like a hanging glacier on a huge scale. Its surface was broken by bergschrunds, and it was rather steep. 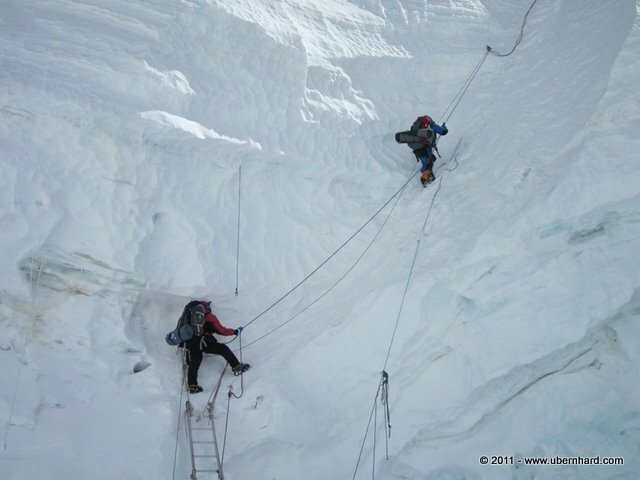 There were all fixed ropes and some of them were on steep slopes. In the afternoon, it started snowing again which made the climb a little bit more challenging. We climbed up to about 6,700m/22,110ft and turned back from there. It was fun for me to descend on all these fixed ropes. The day ended with a good dinner in our dinner tent, escaping from the never ending snowfall. April 24, Easter Sunday, was another rest day for us. First of all we had to clean our tents form the snow. In fact, it had snowed the whole night and the camp looked different in the morning. Later on the sun came and we enjoyed the day outside. 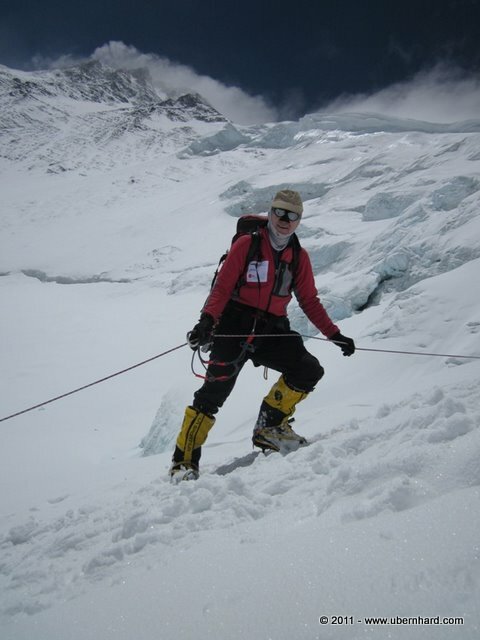 One of our Sherpa’s, Pasang, carried material up to the top of North Col, his second trip. It was a difficult trip for him, because of the knee deep snow. 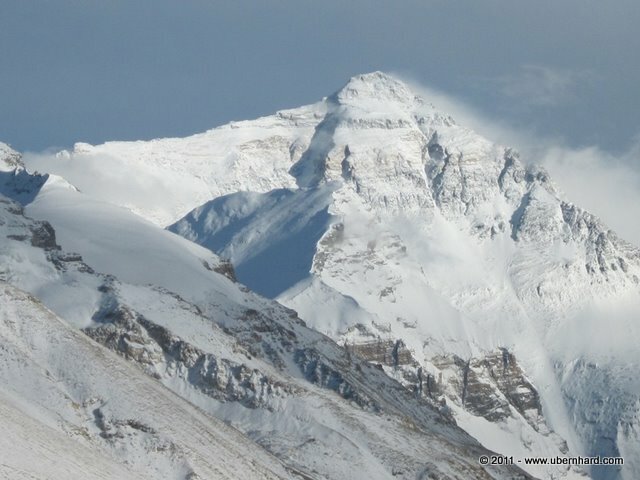 The reason for these trips is that we are planning to spend a night up at the North Col, at 7,060m/23,298ft in the coming days. 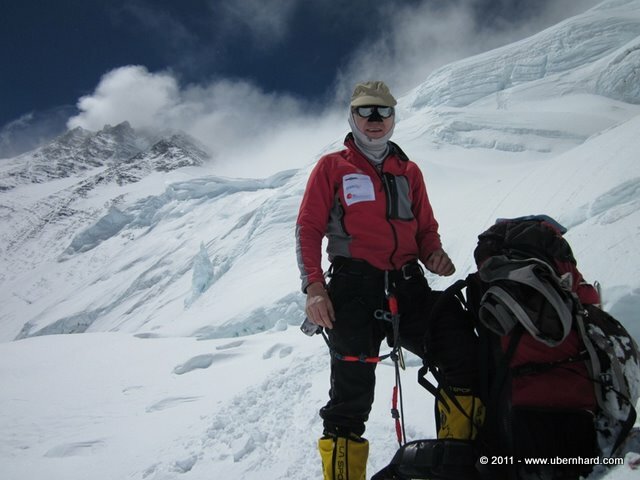 The rest of us relaxed fixed some of our equipment and I wrote on my blog and read the amazing stories of George Mallory’s first expeditions to Mount Everest, in The Epic of Mount Everest – The Historic Account of Mallory’s Expeditions. What a great feeling to be in the same locations where Mallory was in 1921, 1922 and 1924 and reading the historic accounts from these times. The next day we were planning to move up to the North Col, but the weather was bad and there was so much new snow on the way up. So we changed our plan to the next day. 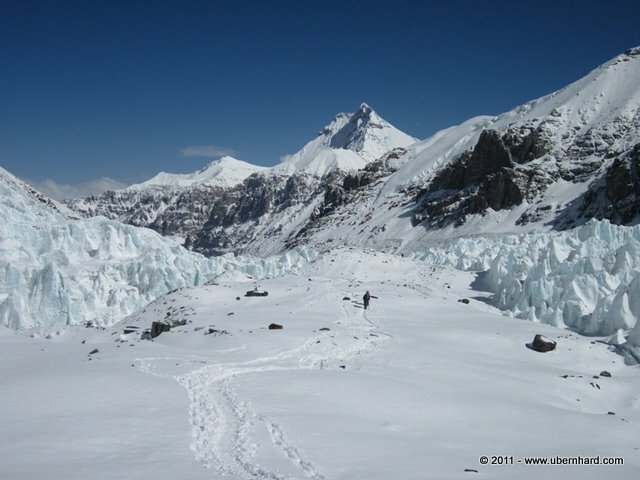 That is how it is in the mountains, and especially at Chomolungma or Everest. She will decide when it will be the right time to move higher. On April 26 we moved on. 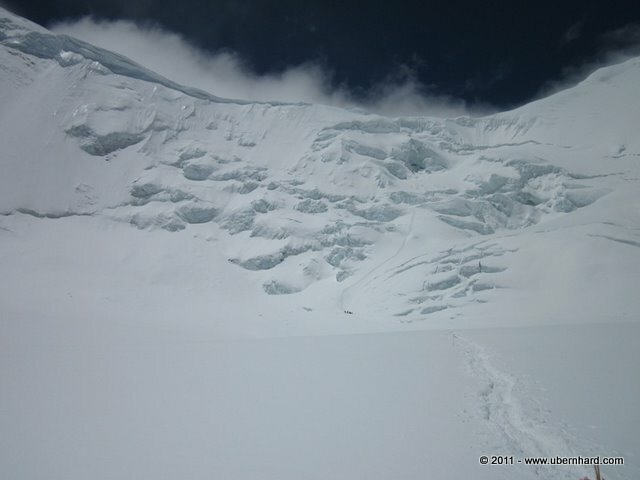 The goal was to climb the way up to the North Col and spend the night up there at 7,060m/23,298ft. 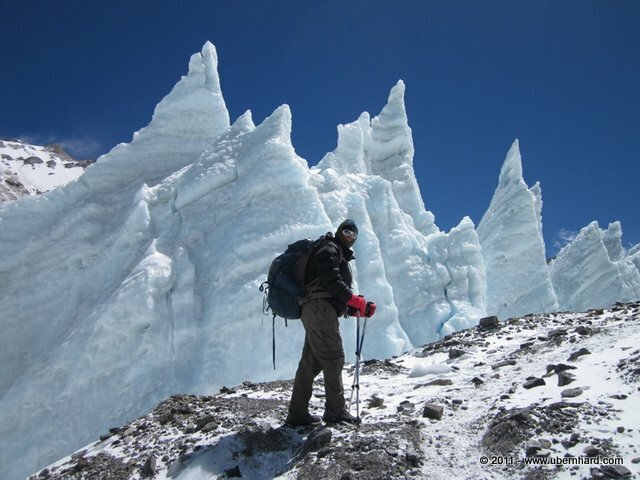 We are still in the acclimatization phase so spending a night at that altitude is very important. The day started out sunny, but as so many times before, the weather changed from hour to hour. 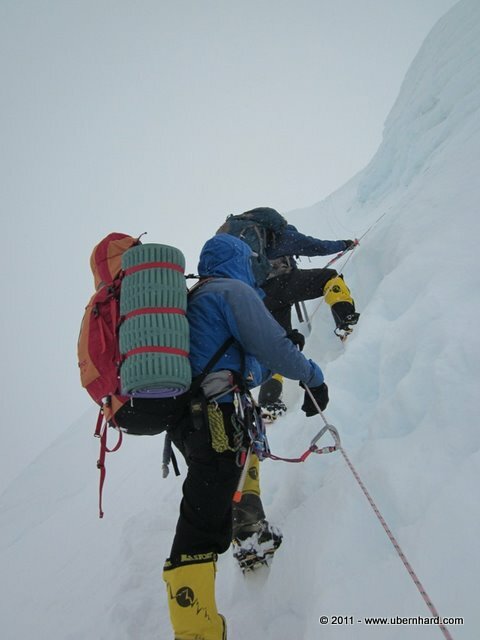 The climb was very exciting and at times very demanding. It was not the actual climb but moving higher and higher on the fixed rope. 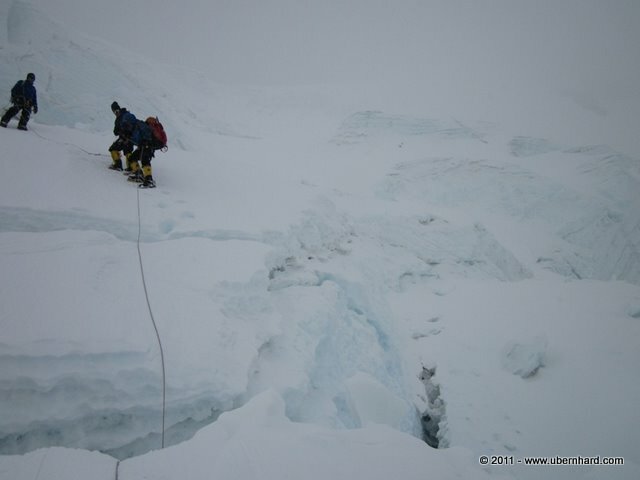 There was also a crevasses to cross. The pictures at the end of this text may explain more than the actual words. 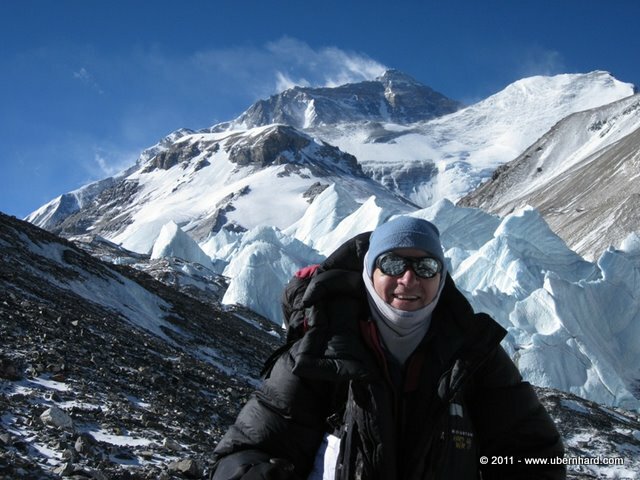 At the end of a long day we reached our camp at 7,060m/23,298ft. The wind had picked up and we moved fast into our tent, eat something and tried to sleep early. So far, this was my highest altitude to spend a night. This will change during the next few weeks. April 27, the next morning it was windy, cold and a poor visibility. Having achieved the objective, we decided to move down. Once again, it was fun to go down the fixed ropes and we arrived in our ABC camp in the afternoon. It was sunny again once we were there and we enjoyed the rest of the day in our camp. 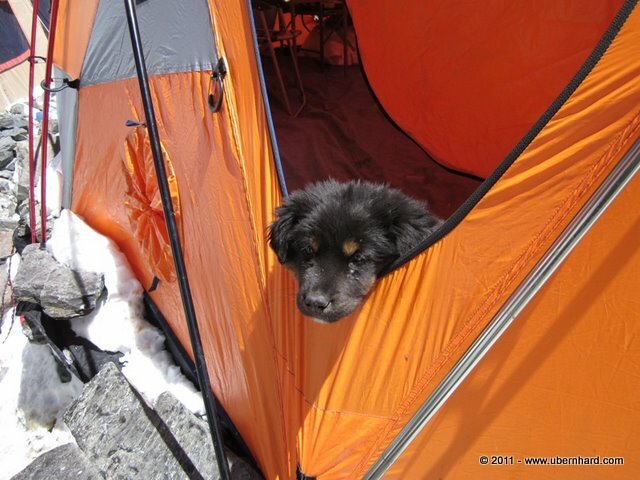 On April 28 we moved down from ABC down to Base Camp. 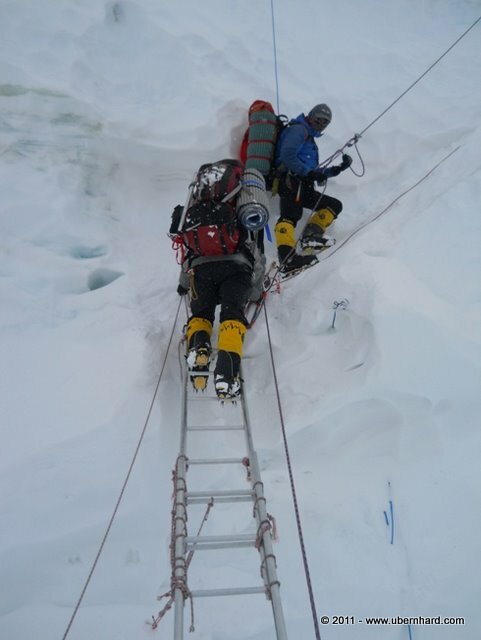 We had achieved our goals in terms of first acclimatization preparation on Everest. 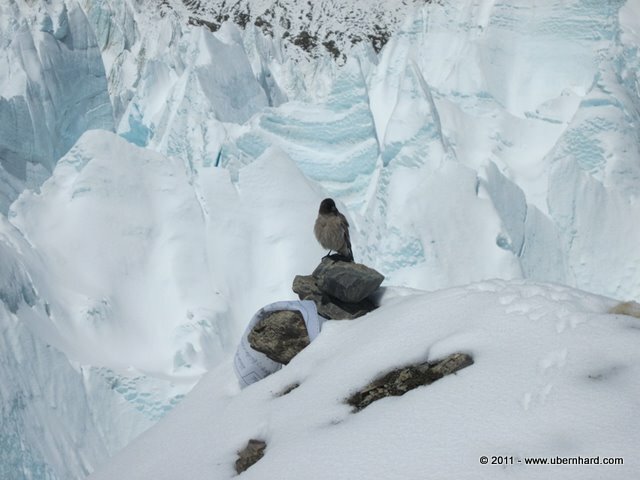 What a beautiful way down the East Rongbuk Glacier it was. Once again, on both sides of the middle moraine we were walking on we could admire the high pinnacles, this time covered with snow. What a stunning spectacle of nature! 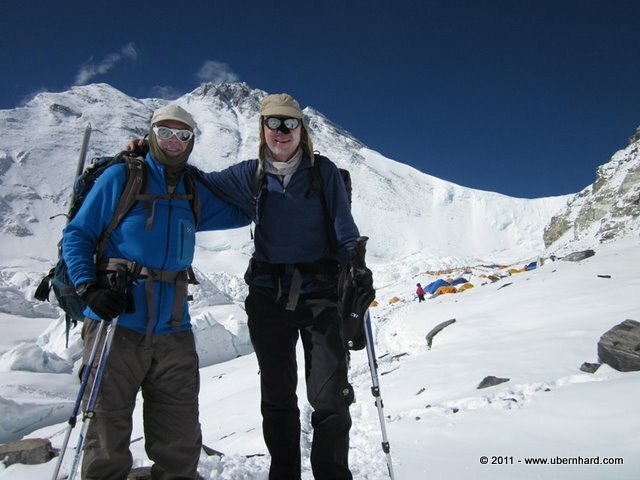 After having hiked 22km/13.75miles we arrived tired and happy in Base Camp. 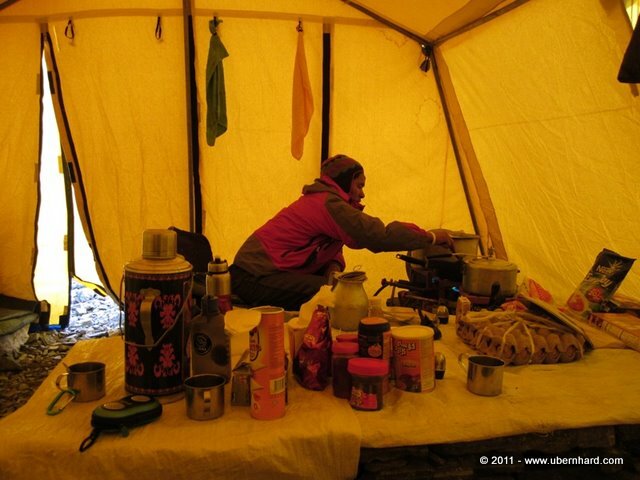 The tents were all still there and our Tibetan kitchen helper welcomed us with a smile and a warm drink. 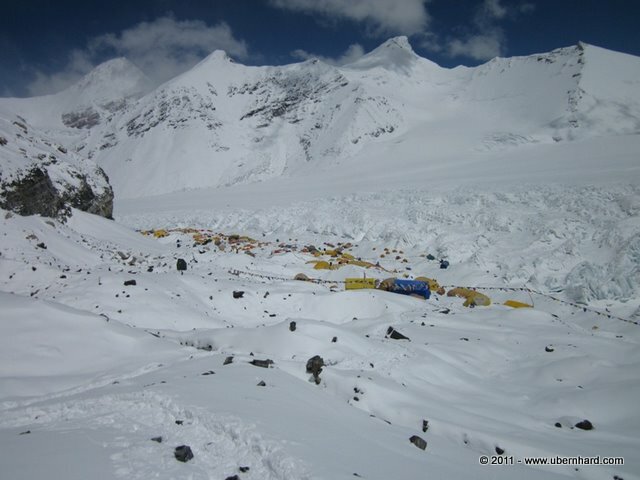 It felt good to be back in base camp after having been at over 7,000m/23,100ft! We will stay here for about a week, eat, drink and rest, wash and shower, and getting ready for the next push, this time even higher.